Miss the days of tie dying, tug of rope, color wars, and the anticipated talent show? Dirtybird Campout was all that and more. This past weekend, October 6th – 8th, the South Shore of Lake San Antonio became the home of the 2017 Dirtybird Campout. A music festival founded by Claude VonStroke that aimed to provide a weekend summer camp experience combined with music from all your favorite DJs. Upon entering the festival, each attendee received a bandana representing their team for the weekend. Everyday games and competitions were held and if your team won, you would be that much closer to winning the color wars. 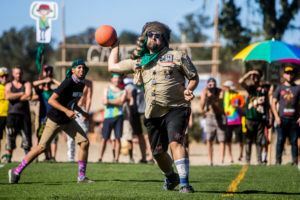 Games included bike races, dodgeball, and volleyball along with some summer camp classics, the 3-legged race, water balloon toss, capture the flag and so much more. On top of that there was also yoga and dance all weekend. The music started at 11am and went way past midnight. Every artist brought their own style into their set. 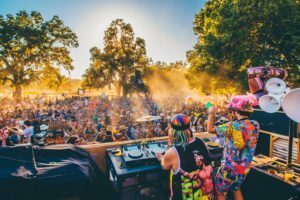 The artists representing the Dirtybird family at the festival included Claude VonStroke himself, Justin Martin, Shiba San, Walker & Royce, Christian Martin, and so many more. We even got to witness a set from Barclay Crenshaw himself (aka Claude) who played a hip-hop-trap heavy set on Saturday night. The weekend was definitely one for the books. With the cabin themed stage decorations, to the Bunk House Bar, if you like to listen to house in a tree house Dirtybird Campout is the festival for you.